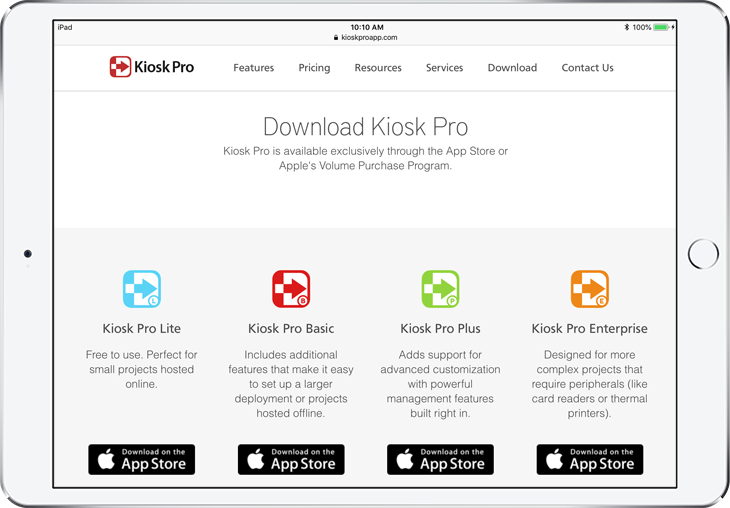 Kiosk Pro can be downloaded in several ways - we've outlined how to download the app directly through the App Store in this article, which is frequently used in initial testing of the app or for small projects or pilot programs. Larger deployments should consider using Apple's Volume Purchase Program to purchase multiple licenses in a single transaction - resulting license codes can be downloaded directly on the device, through Apple's Configurator software, or via a mobile device management (MDM) provider. 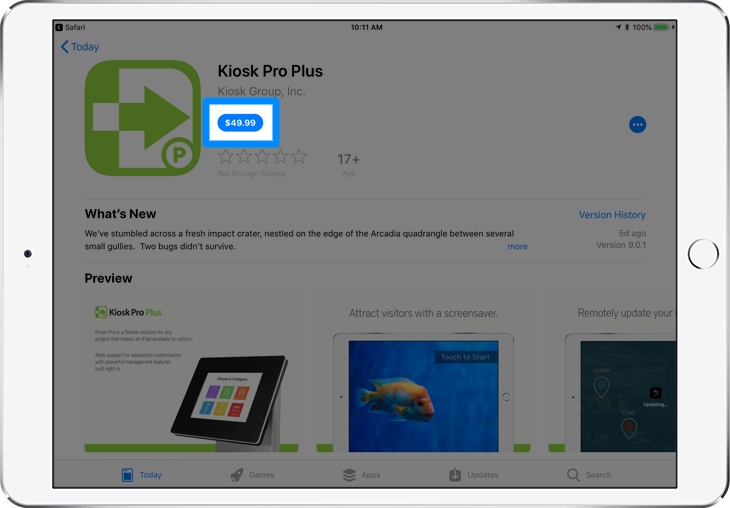 Open mobile Safari on your iPad and navigate to 'kioskproapp.com/download'. Click the 'Download on the App Store' button under the version you would like to download. 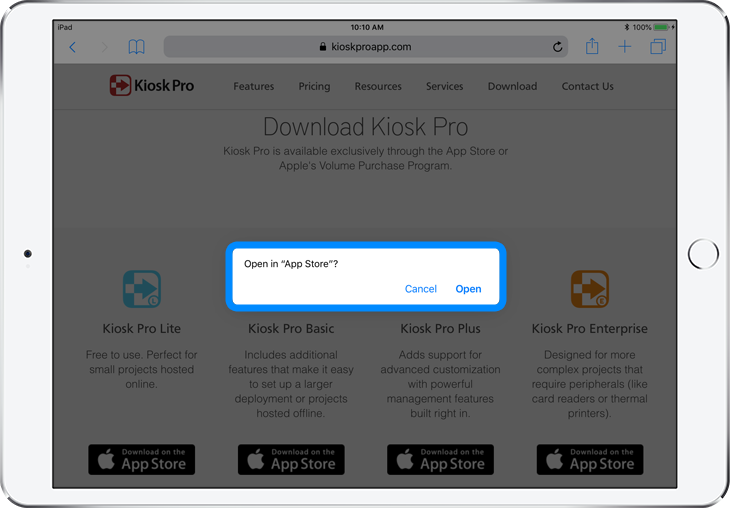 Click 'Open' to allow the link to open in the App Store app. Select the button that shows either the app's price (or says 'Get' for our free Lite version). You may be asked to confirm your Apple ID account information before the app will begin downloading to your iPad. When the download is complete, the download icon will be replaced with a button that says 'Open' which can be used to launch Kiosk Pro. The app will also be available from an icon on the device's Home screen, which can be tapped to open the app. The app license will be permanently linked with the Apple ID used and can be downloaded from the App Store at any time. 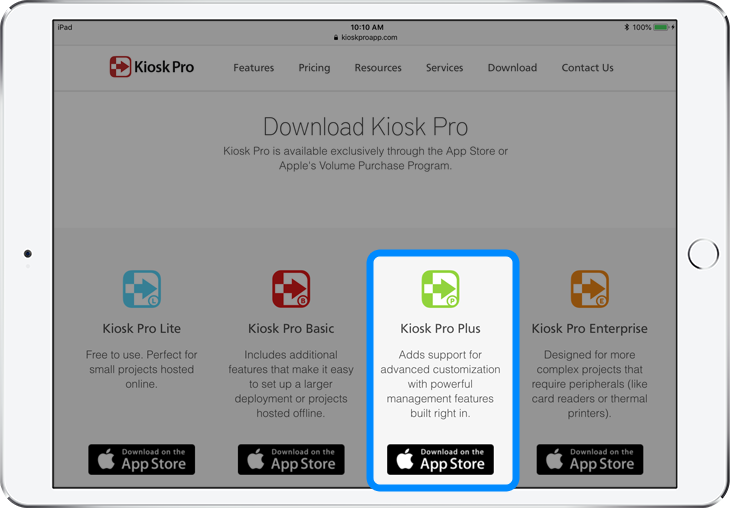 If the license needs to be transferred to another device (per Kiosk Pro's one license per device terms), the app can be deleted off the previous device and downloaded on the new device by signing in with that same Apple ID. We highly recommend keeping a record of the Apple ID and password used for purchase for future reference (either by yourself or someone inheriting the project).